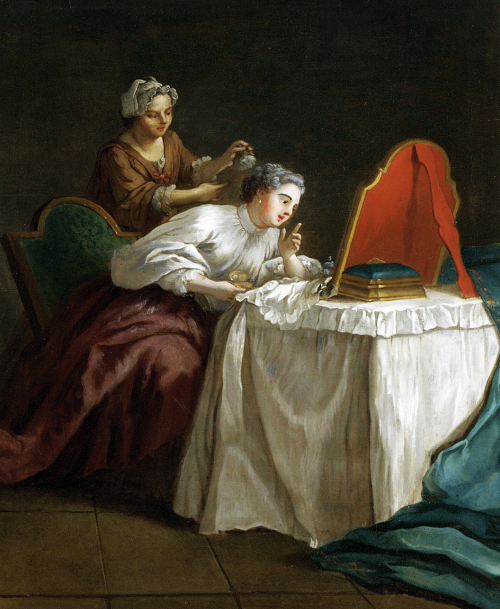 Maids were the workhorses of the Regency. 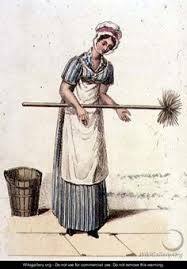 In 1806 there were around 910,000 domestic servants in England. Only 110, 000 of them were men. Maids were responsible for all the cleaning, to include the servants’ areas, polishing, gathering linens to be washed, and putting them away, polishing, except for the silver, making sure the fires were lit in the mornings and kept going throughout the day, empty chamber pots, sewing and myriad other tasks. The average town house was five stories, and there were no modern appliances. Rugs had to be removed and taken outside to be beaten, Curtains had to be taken down to be cleaned, all surfaces had to be dusted, and polished as well as cleaning any ornaments in the rooms. Windows and floors had to be swept and washed. Any stains on the silk wallpaper had to be cleaned. Well, you can see how big a task they had. They were also to be invisible. Maids were answerable to the housekeeper. In medium to large households they had assigned tasks. Most maids started at a fairly young age usually 12 or 13. We hear a lot in romances about how the gentlemen of the house would take advantage of pretty maids, but I’m not sure how prevalent that was during the Regency. I would hazard a guess that the housekeeper would do her best to safeguard the female servants. As with other servants, maids had contracts. They were granted a place to sleep, food, a measure of tea, an allowance or fabric for clothing. 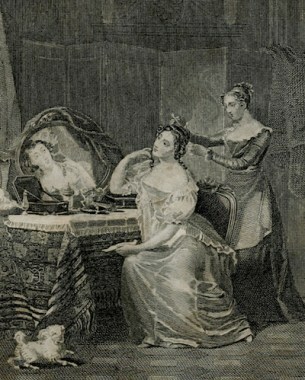 During the Regency, maids did not have uniforms. They could also have waged deducted for breakage or making a mistake. Most were expected to attend church services. Pregnancy was grounds for immediate dismissal without a reference. Footmen were, in some ways, the Regency’s splurge. Not that they weren’t necessary. They were in fact extremely necessary to one’s status. However, all male servants were taxed. Therefore, the more male servants one had, the greater the tax. 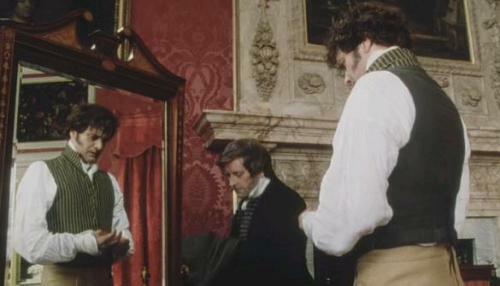 The reason they were a splurge is that they were also the Regency version of eye candy. Men hired for the position of footmen were tall, handsome, fit, and known for a well-turned leg. Footmen were the only servants, aside from possibly the coachman and outriders, who wore uniforms called livery. Footmen worked for the butler. Many houses had a 1st footman whose job it was to man the door and attend the master and mistress if the butler was not available and the household had no under-butler. Footmen were used to run errands (running footmen), clean silver, serve at the table, and if a lady wanted tea a footman would bring it. They also assisted maids in moving heavy furniture to clean, carrying tubs or buckets, and opened and closed doors. They were used to carry packages, and follow ladies around shopping or on a stroll in the park. 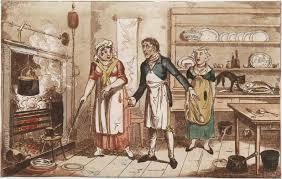 Regency slang for a footman was a fart-catcher, because they walked behind the mistress or master. Rounding out the senior servants are valets and lady’s maids (also called dressers and abigails). These personal servants took orders only from their master or mistress. They were highly trained. They not only dressed the lady or gentleman, but they cared for all the expensive clothing, to include cleaning, mending, and altering the garments. The laundress only washed linens. Therefore, the remainder of the clothing was left to the lady’s maid and valet. But that wasn’t their only duty. They were responsible to dressing and cutting hair, keeping jewels clean and in good order, sending messages, supervising the cleaning of the lady or gentleman’s bedchambers, packing, serving breakfast or other meals in the bedchamber, and ensuring that everything in the room was just so. When traveling, the valet and lady’s maid would frequently travel ahead to ensure an inn room was made comfortable for their master or mistress. They would even bring sheets to change the beds. They were the first person a gentleman or lady would see in the morning and the last person at night. The one thing a valet did not do was tie the gentleman’s cravat. Or if he did, the gentleman would never admit to it. Today we’ll talk about cooks. Cooks could be men or women. If they were men, they were most likely Frenchmen who came over to England to escape the French revolution. Aristocrats weren’t the only ones targeted, their servants were as well, but that’s another post. Naturally, French cooks were paid more. 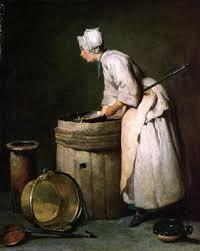 It appears that few houses in the country had French cooks, but relied on female cooks instead. It would not be unusual for the female cook to remain in the country for the Season while the family hired a French cook in Town. The cook reported to the mistress. The cook was responsible for making up the weekly menu to be approved by her. If the lady of the house was giving a party, the cook might be responsible for cooking the entire menu. However, for a ball, it is likely that they had caterers. Günter’s, for example, provided ices for many private events. In addition to special events, the cook was responsible for baking all the bread for the family. Although, there were bakeries in Town, many of them used fillers. The cook was responsible for the scullery maids, and if there was a dairy, he was responsible for that as well. For food stuffs, he coordinated with housekeeper for their purchase. In the country, she/he work closely with the gardener in charge of the homefarm and the greenhouses. 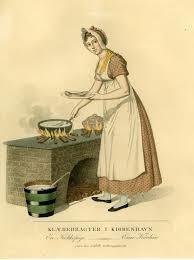 English cooks (almost always female) were known to remain with a family for more than one generation. Antonin Carmen was the most famous chef of the Regency, and the first celebrity chef. He cooked for Napoleon, the Rothschilds, and the Romanovs. In 1817, he was cooking for the Prince Regent. Not even Goodreads can recommend any books where cooks take a prominent role. Housekeepers are some of my favorite people. 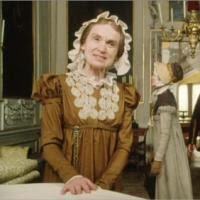 During the Regency, the housekeeper answered directly to the mistress of the house. 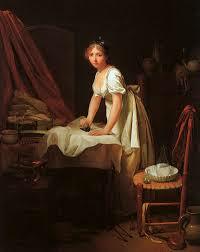 Housekeepers, as did all Regency servants with the exception of footmen, wore her own clothing. Therefore it was very likely that she would receive cloth or an allowance in her contract. She supervised all the female staff except the kitchen maids, nurse, and lady’s maid. 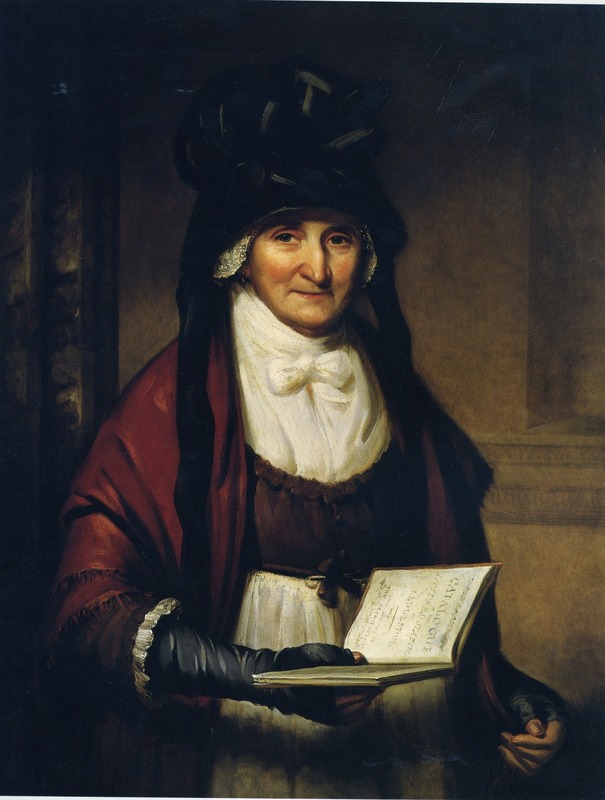 Her duties included, but were not limited to, maintaining linens, china, stores of household items, having recipes for everything from cleaning products to medicinal items. Making sure the house was clean and well maintained. She also kept the household records. Like the butler, her room was in the cellar. She was the keeper of the keys for the household. If there is not house-steward, she would also be responsible for all domestic expenditures. 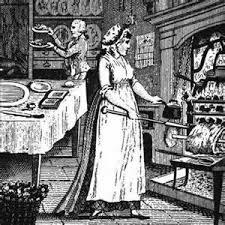 In coordination with the cook, she was in charge of the purchasing of spices, and other food stores. We’ll start with the upper staff. Any house that could afford one had a butler. They greatly added to ones status. The butler worked directly for the master of the house. In old families, he might have risen from footman to his position. A butler never wore livery. His working grab consisted of a dark jacket, vest, and knee breeches. His linen white, and neckcloth immaculate and simply tied. His shoes would have a good shine. His employment contract included items such as tea, possibly a suite of clothing a year, days off, and his salary which would be paid on quarter day. The butler had the following minimum duties: Charge of all indoor male servants, the silver, to include cleaning it. he was responsible for the wine cellar stockage, stocking all other alcoholic beverages. Keeping the records, and pouring. He was in charge of everything to do with the dining room, including the cleaning of the room, and ensuring the linen was clean, and service at meals. Although, tea was not considered a meal during the Regency. Ladies did have tea and the butler served. He was also the gatekeeper to the house. If guests were expected he’d be at the door, but in the case of people obviously not of the gentry, he could deny them entry. He would, of course refuse entry to anyone the master ordered him to. He was also responsible for all of the mail coming into and out of the house. The butler slept near the room where the silver was stored, usually below stairs. If he married, it would probably be to another servant. There is some evidence to suggest that is was not uncommon for the housekeeper and butler to be married in some households. I think it was an unwritten rule that a butler never showed what he was feeling. I don’t know of any books about butlers, but there are many books in which butler play bit parts. Most of Georgette Heyer’s books include a butler as so most of mine. I welcome any recommendations you have. We’re moving on to servants. In England it was also middle class employment. Servants were integral in every gentry home. If at all possible, even the poorest would hire a maid of all work. It was a sign of status. In large houses, they were a necessity. The number of servants a household required depended upon the size the house, the number of people in the family, and their budget. For example, in Georgette Heyer’s Friday’s Child, the hero and heroine have eschewed the family town house and hire a small residence. The young couple decided that the following servants were necessary to their comfort: A valet, lady’s maid, cook, butler, footman or page-boy, coachman, two grooms, two maids, and a tiger. The way servants were treated depended on the family. In households like the Duke of Devonshire’s, maids were in danger of being seduced by him. In other households, the housekeeper kept vigilance over the maids, and if any of them turned up pregnant and not planning to marry, they were let go without a reference. Or, maybe a footman or groom was responsible, and the couple were made to wed. In many families, generations of servants served the family. In the country, it was not unusual for servants to be related and to be related to servants in other households. After all the landowners were the largest employers in the area. How familiar the servants would be with the master or mistress also differed widely. If a peer, as a lad, had been put on his first pony by a young groom, that groom would more than likely feel as if he could speak his mind on some subjects when they were older. Or perhaps, as children, they stole tarts from the kitchen, or muddied the floors and had been chastised by the older servant. This ease of interaction was probably more common if the gentleman inherited his title at a fairly young age. On the other hand, some families had houses with interior tunnels for the servants’ use so that they couldn’t be seen. There were also accounts of a family whose finances took a downturn and the older servants remained with the family out of loyalty. So you see the relationships were as varied and complex as the people themselves. Still, no matter how close a mistress or master was with servants (particularly to the nurse, for example, who may have raised them) never think they were “best friends.” Being a friend requires that both individuals have an equal social status. That was never the case with servants and their mistresses or masters who had the power to let them go. Book recommendations: Friday’s Child (setting up house) and the Grand Sophy (fun interactions with servants) by Georgette Heyer. The Temptation of Lady Serena (fun interactions with servants) and You Never Forget Your First Earl, (setting up house) by me. Only a Mistress, by Jenna Jaxon. I’ve put out feelers for other books, but haven’t received any recommendations yet. Please feel free to add your own.